For some of you who have read previous articles on the site, you may already be well aware of this, but if you don’t already know; I love Dreadball! I genuinely do have a real fondness of Dreadball for a variety of reasons, with the most notable being the scoring system, the varied tactics created by different player positions and teams, plus the general carnage. Recently a few people have said to me “It is just like Bloodbowl” and to these people I say: you obviously haven’t actually played it. Anyway putting this loved up rant to one side, Dreadball is now firmly one of my favourite games, so when I heard that Mantic were releasing the Galactic Tour Series to be played alongside Season 3, I was obviously very excited, but also a little worried, as I have seen other games do similar things with underwhelming results. The concept behind the Galactic Tour Series is a simple one, with the popularity of Dreadball growing throughout the Corporation, more leagues are appearing on some of the stranger planets on the further reaches of Corporation space. With these new leagues, there are some new rules and some slightly… less safe stadium designs to play in. With the first of the series; Azure Forest now available, it was inevitably going to be one of my first purchases at Salute this year. 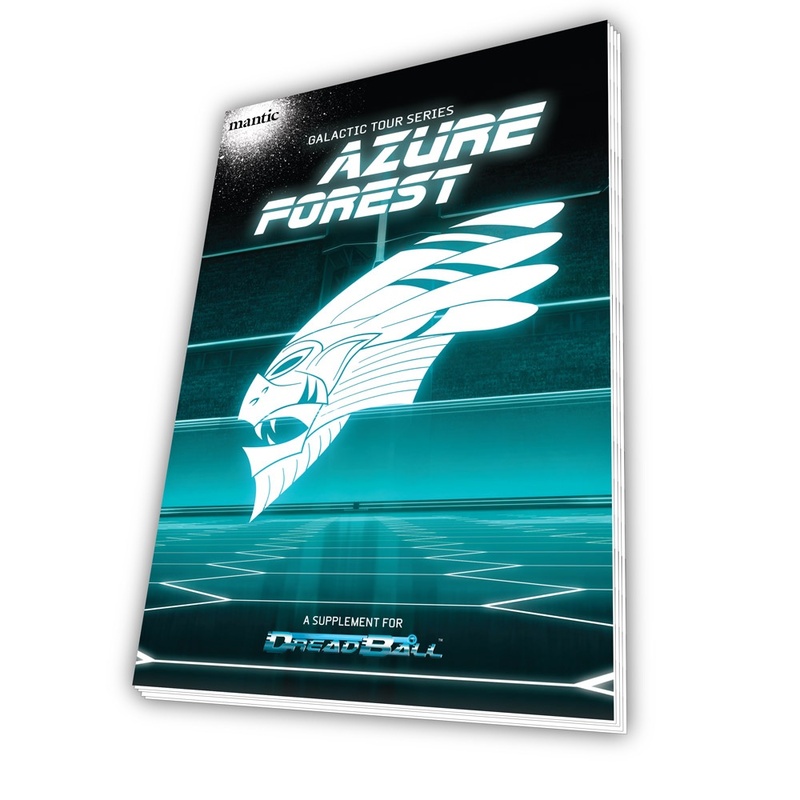 I am pleased to say that now I have played a game in Azure Forest, I am sold, it’s still Dreadball that I know and love but having to play through harsh weather conditions and earthquakes can at times really change the game and your tactics. So what do you get in the box? Azure Forest comes with a weather table as the weather will change throughout the match, which creates some real tactical challenges. Being unable to dash, reducing the range and accuracy of throws and, possibly the toughest of all; heat wave, which tires all players out and reduces them to using just 1 action token a turn can both be found in the dekc. As I mentioned before these additions can be genuine game changers and will change the way you use your team. Plus the fact that the weather changes randomly will really keep you on your toes and I can testify to the fact that this makes the game a lot more exciting and guarantees that no two league games will play out the same way. 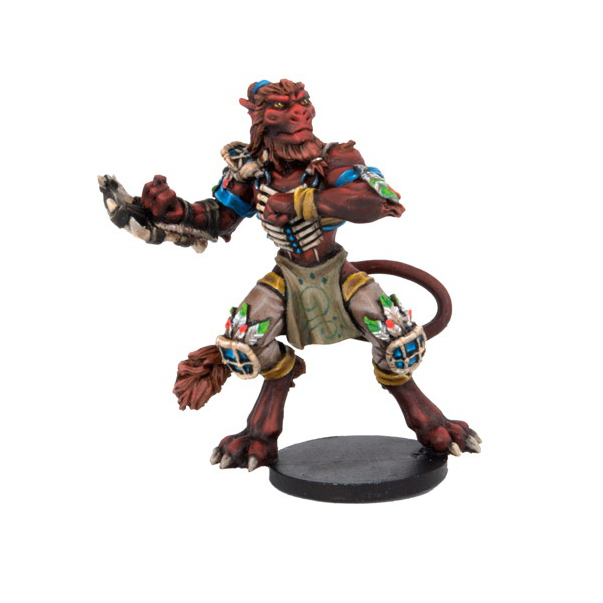 You also get a brand new MVP – A’Teo Adysi – who comes with a nice back story and is from a race called the Ynjdi. 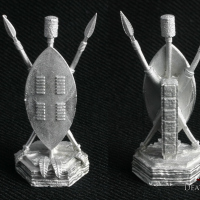 A new species for Dreadball one must ask if they’re a team for further down the road. He has a nice set of stats and special skills, and without seeming overpowered, looks like he could mix it with some of the better players. Interestingly A’Teo is a metal figure which is a real change for Mantic and, on his occasion, it is one for the better. Because he is metal, there is great detail on the model, probably better than on any of the plastic figures they have released so far. Also unlike some metal models, I am also pleased to say that my A’Teo came with little to no flash on it. Another nice touch with the Azure Forest set is that it comes with its own trophy. Granted it is a bit of a novelty and not really necessary at all, but as I said its a nice idea and its metal too. Again, just like the MVP there is a good level of detail on it and it looks like it will be fun (and quick) to paint. In Azure Forest it is not just the weather that you need to be prepared for as Mantic have added another nice element. You also get 15 new game cards to be shuffled into the main game deck. They are marked differently on one side which is a nice touch so the don’t look any different face down but they can be easily separated from the deck. Just like the weather, the new cards have been designed for maximum carnage. Earthquakes, creatures falling out of the rainforest canopy onto the pitch, and a nasty bout of jungle sickness (that just so happened to affect my striker who was carrying the ball) all feature. The new event is really quite fun and a little more chaos that although it won’t change a whole game, can make or break a rush. Finally you also get the 32 page rule book, but unlike all the main Season rule books it is A5 not the regular A4. This however makes for a well thought out and add yet more challenges to playing in the Azure Forest. A couple that cropped up in my first game were an very little difference as it is still well put together. As well as the stats for A’Teo, it also contains profiles and start for 3 other MVPs now available to buy and some nice background about the Blue Moon and the Azure Forest league. It also covers revised tournament rules to play a specific league, and if you do Mantic has also written some nice rules for blessings from the town elders that you can buy to temporarily improve a player. The rules do feel a little light and there is possibly too much background, but it is a good read and with all the other bits you get I am almost certainly being too picky. I’m sold. 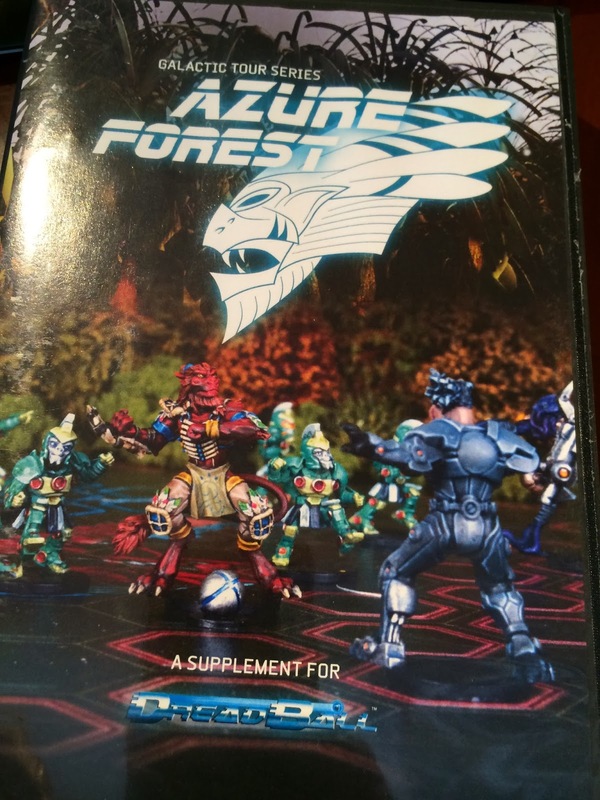 So all in all, Azure Forest is a great stand alone supplement and it adds some extra spice to any tournament or league, and is well worth giving a go. More exciting than that is it’s only the first of the Galactic Tour series and it is a strong start. I can’t wait to see what planet and what challenges the Galactic Tour will throw up next. If you are as intrigued as I was then the last point to mention is the price. The box is less than £15 and can be bought on Firestorm Games for £13.49 which seems pretty good value, especially when most other games would charge you £15 just for the cool new metal special character or the rules but certainly not both or with the other extras too.